This article is about the hippo villager. For the anteater islander with the same name, see Lulu (islander). 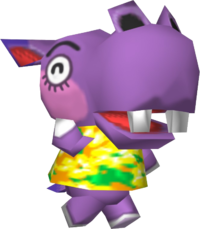 Lulu is a peppy, hippo villager in the Animal Crossing series who's only appearances are in Doubutsu no Mori and it's GameCube ports. Lulu's Japanese name, El Niño, is Spanish for “the child,” referencing the childish nature of her peppy personality. It could also be a reference to El Niño, the warm current that affects many tropical islands in the Pacific Ocean. Lulu is a purple hippopotamus with white-tipped hooves, as well as white circles around her black, closed eyes, which may be mistaken for sclera with eyelashes. Above Lulu's eyes are two thin eyebrows. She has lilac blush under her eyes creating large circles. The inside of her ears are magenta, as well as inside her mouth. Lulu's initial clothing is the flowery shirt. As a peppy villager, Lulu will always appear to be in a good mood. She will get along with other villagers including the player. She will enjoy the usual hobbies and may ask the player for bugs or fish that she finds cute. She will easily get upset, but due to a short attention span, she will forget ever having the conversation. Like all peppy villagers, she dreams of becoming famous in the future. She will get on well with normal, lazy, and peppy villagers, but may annoy snooty and cranky villagers with her upbeat personality. Not too long ago, Lulu awoke from a pleasant outdoor nap and yet out a huge yawn. Unfortunately, a nearby mosquito flew directly in her mouth, so now she tries to sleep indoors whenever she can. Modified on March 20, 2019, at 20:44.